Quite possibly the most popular figurado cigar line in the world, the Arturo Fuente Hemingway was the Fuente Family's original small batch cigar. Featuring some of the most masterful construction found in any premium cigar, the Hemingway is comprised of the company's finest Dominican binder and filler tobaccos beneath a creamy Cameroon wrapper. This extraordinary combination produces smooth, earthy flavors with a spicy finish and amazing woody aroma that has captivated the palates of discerning smokers for decades. For uncompromising high quality and remarkably rich character, simply put, the Arturo Fuente Hemingway is in a league of its own. I purchased the 5-pack as a treat to myself and I was really really pleased! It is a bit tight on the label side and I had to roll it a bit to get a nice draw, but it loosened up after about the halfway point due to it being warmer. I may have not cut it up far enough; I'm not sure. I am a newbie with cigars and still learning but this is one of the best cigars I've had. It burned evenly the whole way, didn't have to touch it up once! I usually have to do that with cheaper value cigars. Really looking forward to the rest I have for this upcoming weekend! This cigar is just in another league. Well worth every penny! If you're reading this wondering if you should try it, I strongly urge you to give it a try! It doesn't disappoint! 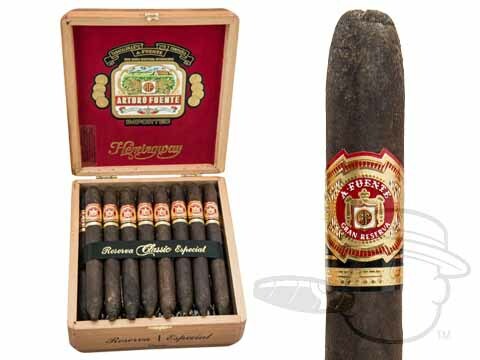 Arturo Fuente Hemingway Classic Maduro is rated 4.7 out of 5 based on 3 customer ratings.